What if you were told that 10-minutes of your time could save a life? And–just maybe–your own life. Or your kid’s. Or your dad’s. Yes, mom’s life, too. 10-minutes devoid of any request for a single penny. 10-minutes simply spent sitting…and watching. Okay—if you’ve peeked at the tags on this post—your hunch is correct. This is a video about texting while driving. Maybe you already feel bombarded by the anti “TWD” campaigns. But you’ve probably never seen a video quite like this one. It’ll strip-away any lurking numbness from the topic. This is Reggie Shaw’s story. And the story of the people he killed. And their families. 10-minutes. Not a second wasted. Please watch, and perhaps, another life won’t be wasted. A safe driving event in Auburn brought more than 200 teens and their parents out for the day to learn advanced vehicle handling skills from instructors from across the nation. The National Governor’s Highway Safety Association and Ford Motor Company brought their touring event to Western Washington this week. Director of Licensing Liz Luce welcomed the students and parents to the half-day event and took a spin on the driving course as well. Luce said that as a mother and grandmother, traffic safety and top-notch driver education is one of her top priorities for the agency. Along with DOL, the State Patrol and Washington Traffic Safety Commission partnered with the event. The Department of Licensing is aware many customers around the state recently experienced longer-than-average waits for service in driver licensing offices. All of us at DOL would like to thank these customers for their patience. Summer is the busiest time of year in our offices due to increased numbers of people moving to our state and a large number of teens getting instruction permits and new driver licenses. Both of these types of transactions take much longer than a typical license renewal or replacing a lost license. In addition to our expected increase in customers this time of year, right now we also are dealing with legislatively-mandated temporary layoff days due to budget cuts. These layoff days are causing increased wait times in our offices that last for several days after the actual office closure. Many customers who need to take care of routine business like driver license renewals, getting a copy of a driving record, or getting a replacement license or ID can avoid our offices altogether by taking care of their transactions online. Visit dol.wa.gov to see all of our online service options. We also are working on new ways for customers to take care of routine driver license transactions over the Internet. In coming months, we plan to introduce new online services that will allow customers to change their address or have a license reinstated after a suspension. If you do need to visit a driver licensing office, take a minute and check out our short video with tips on how to make your experience with DOL more efficient. Due to state budget cuts, DOL offices will be closed for business on Friday, August 6, as employees take the second of required temporary layoff days that must be taken over the next year. State temporary layoff days do not affect county or private vehicle licensing offices. 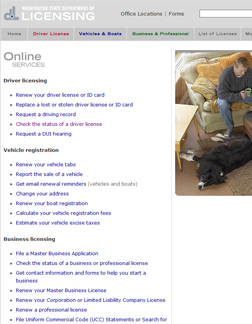 A list of vehicle licensing offices is available on the department’s website. Temporary layoff days for state employees were approved by the Legislature and signed by the Governor in the face of a $2.8 billion shortfall in the state’s general fund. You are currently browsing the Licensing Express blog archives for August, 2010.